Lot 3: CD 686 FOLEMBRAY // No 291 Color: Rich Apple Green Description: Wonderful condition! Just a little scuffing on the inner skirt. There's not even flaking around the damage-prone "eyes." This insulator has been described as "a Noser on steroids," comparing it to the CD 667 which is an inch shorter. 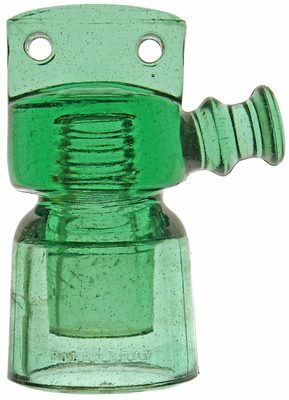 This relatively scarce style is an unusual combination of a "spook" (fuse insulator) and a "robot" or "T-Bar" but with only one arm instead of two. As fuse insulators, the wires were attached to copper bolts that went through the "eyes" to protect from electrical disturbance. The upward pointing arm (rather than the typical horizontal arm) and the outstanding color make this a really unique insulator for sure!